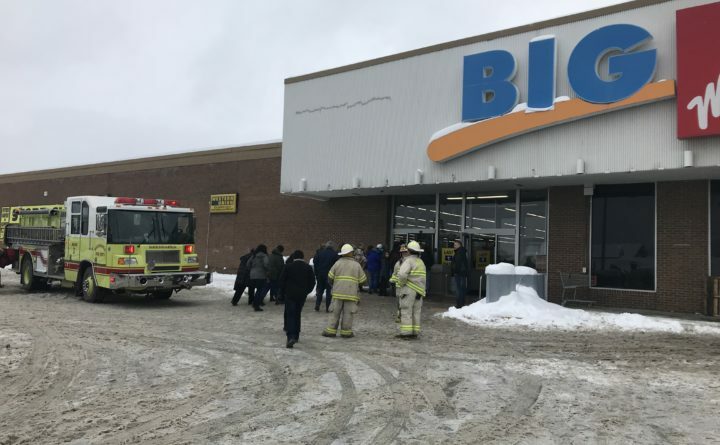 Firefighters give shoppers the all clear to return to their shopping at the Madawaska Kmart after a heating unit malfunctioned filled the entryway with smoke Sunday morning, the store's last day in business. The heating system at the Madawaska Kmart malfunctioned Sunday morning, causing smoke to set off alarms and force the brief evacuation of employees and shoppers on the last day of business. The heating system right above the front door within the corridor malfunctioned, Madawaska Fire Chief Jim Soucy said Sunday. Firefighters shut off the offending unit and verified that the other heating units in the building were operating fine. Within an hour, the firefighters had cleared the scene so that employees could return to work, and shoppers, many of whom had just sat patiently in their cars during the incident, could return to purchasing their last deals during the final hours of the last Kmart in Aroostook County. Sears Holdings Corp. announced plans in October to close 142 unprofitable stores across the country, including the Kmart in Madawaska, as part of its effort to restructure financially under bankruptcy proceedings. The store was slated to stay open through the holidays. After Christmas, Kmart posted a sign on the door counting down the days with Sunday being the last day.